Professor Andrew Gamble, Professorial Fellow at SPERI, yesterday gave the Commencement Lecture of the Department of Politics which celebrates its 50th anniversary this year. The lecture covered the different meanings of austerity and anti-austerity. Andrew focused on why the financial crisis of 2008 still dominates the political economy landscape. He argued that the crisis was as serious as 1929 with one difference: in 2008 governments acted together to prevent a meltdown of the economy, but the crisis has not been solved, just delayed. 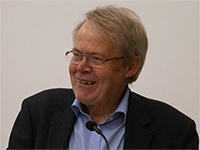 Andrew deplored the lack of radical experiments amongst western governments and argued that there are deep structural contradictions in neo-liberal economies, but no alternatives are proposed and initiatives to reform global governance are blocked. He ended on the cautionary note that we are taking for granted 70 years of peace and stability, but the history of previous economic crises shows us that we must be aware of the fragility of our political system.